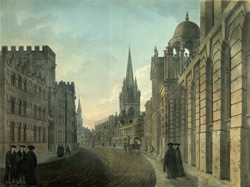 View of Oxford High Street, described by Nikolaus Pevsner as one of the world's greatest streets. The gently curving street has a number of impressive college and ecclesiastical buildings along it. Travelogue author Celia Fiennes visited Oxford in the late 17th century, noting that "the Streetes are very cleane and well pitched, and pretty broad" and "the High Streete is a very noble one, so large and of a greate length". Down the street she saw the University church, St Mary's, which she thought was "very large and lofty but nothing very Curious in it".